310: Do You Need a Coach? 274: Dealing with People, How to Handle Got a Minute? More! Kate Kurzawska is a freelance translator and content writer. She also works as a Marketing Assistant at TimeCamp and is a host of Stay on Top of Your Work. In this bonus episode, I discuss why there's more to life than just working and I give you some things to think about to improve your work/life balance (yes, that's very important). In this bonus episode, I discuss why I've switched back to readying print books after being a huge fan of ebooks. I also reveal an odd habit of mine when it comes to books. In this bonus episode, I discuss why procrastination must be murdered and how to do it (no guns or knives required). In this bonus episode, I discuss the what gratitude is, how you can express it, then I ask a powerful question and end with a call to arms (action). In this bonus episode, I discuss the what you can do in order to be your most productive self. What did you think of this episode? I want to know. Go to MarkStruczewski.com/self and leave a comment. The importance joy plays in your productivity. It's much easier to be productive when you're full of joy than anger and frustration. Why it's important to be flexible and I gave you two ways to deal with your lack of flexibility and to build the muscle. On this episode, I discuss whether or not it's okay to watch TV, or play video games or hang out with your friends. You may be surprised by my answer. 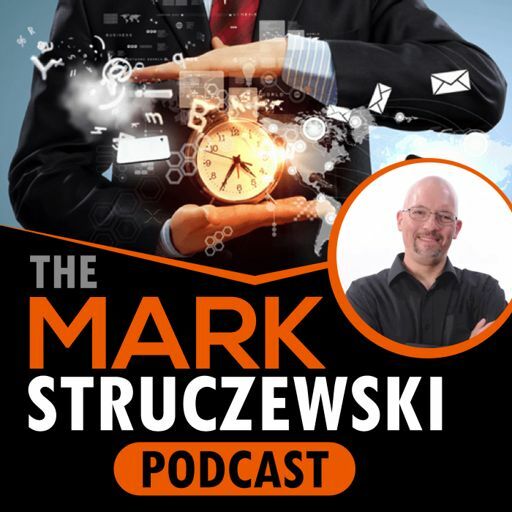 On this episode of The Mark & Michelle Show, part of The Mark Struczewski Podcast, we discuss what it's like for Michelle being married entrepreneur Mark. We also talk about good, the bad and the ugly of it. On this bonus episode, I talk about how you REALLY goals including the first step, January 1st is just a date on the calendar, the SMART method, and what you really need to do about your goals. On this bonus episode, I make a plea to you, my dear listener and fan. Please don't take this plea lightly, it's important and if you do as I ask (beg?) you to, you'll make my day. On this episode, I discuss why you need to have a morning routine, the mistakes so many people make when creating one, what my morning routine looks like plus dos and don'ts of a morning routine. Jarrod Warren owns a financial planning practice in Dallas and hosts the Success 101 Podcast, a peak performance podcast about maximizing your potential in all areas of life. In this bonus episode of The Mark Struczewski Podcast, I explain what's up with the domain MisterProductivity.com, my love of Cal Newports' awesome book, Deep Work and my plans for the next few years. Jake Jordan is a 5-time award winning marketing director, Co-Founder of the first ever LinkedIn Show 'The UnLearn Show' and co-founder of RealLifeBrand.com. A former CIO, today Eric Bloom is the Executive Director of the IT Management and Leadership Institute, a leading provider of IT leadership, interpersonal communication and business skills training. 117: Margaret A. Johnson, President of Ideal Training, Inc.
112: Mike Muhney, Co-Inventor of ACT! 111: Bill Protzmann, Servant at Music Care Inc.
Brian R. King is a master of perseverance, resilience and productivity. His knowledge and skills have been forged in the fires of learning and physical disabilities that have made him an unstoppable force. 102: I Turned Off Almost All of My Notifications! Jeremy is the host of the Create Your Own Life Podcast, helping listeners to create life on their own terms. 096: Just Who is Mark Struczewski? In this sixth bonus episode of The Mark Struczewski Podcast, I talking about calendars versus to do list apps. I go over what goes on your calendar and what goes on your to do (or reminder) list. Cindy coaches entrepreneurs with ADHD to get clarity about their business and their customers, to break down their big vision into an actionable roadmap, and to create systems and automations that increase productivity. Ben is passing his years of sales expertise on to the next generation of salespeople via speaking, coaching and his products. He has been the top salesperson at every company he has worked for! In this fifth bonus episode (and my 84th episode overall), I talk about the lessons I learned from doing 83 podcast episodes for The Mark Struczewski Podcast. Alex Pirouz is the host of the Ask Linkfluencer Show, columnist, speaker and CEO of Australia’s leading LinkedIn training company. In this fourth bonus episode, I talk about the productivity scale. In this third bonus episode, I share my thoughts about choosing productivity apps. What did you think of this episode? I want to know. Go to MarkStruczewski.com/bonus003 and leave a comment. In this second bonus episode, I talk about how the phrase "Improvise, Adapt & Overcome" applies to your productivity. Michelle is a recovering IT support professional, currently working with Mark Struczewski. She takes care of the things that Mark doesn't have to do so that he can focus on revenue-generating activities. In this premier bonus episode, I talk about authenticity and courage and how they factor into being productive. What did you think of this episode? I want to know. Go to MarkStruczewski.com/bonus001 and leave a comment. Ashley teaches businesses that are interested in becoming more digitally social how to leverage social media effectively. Melanie is a TedX speaker, 7x best selling author, business consultant, and publisher. Elisabeth is a digital coach. She works with women entrepreneurs who want to enhance their visibility online, helping them make their own voice stand out from the internet noise. What does it mean to gamify your productivity? Gamification is another tool you need to have in your tool bag. Everyone loves vacation. But...how you prepare for it makes a big difference. In order to become more productive, it is critical that you tell your time where to go instead of wondering where it went. A great way to do this is to become a calendar ninja. Here are 5 things that affect your attitude and thereby your productivity. FIVE WAYS TO DEAL WITH DISTRACTIONS AT WORK. Note: this is NOT a paid review. In fact, the developers don’t even know I am doing it (well, they do now!). HOW TO CHOOSE A PRODUCTIVITY APP. What is a productivity app? I am referring to the calendar, reminder/to-do, and notes apps.